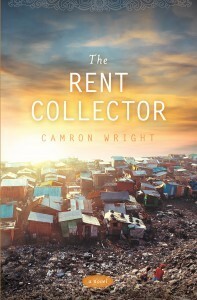 My neighborhood book group met this month to discuss a novel I'd never heard of before, The Rent Collector by Camron Wright. This fictional story about a real-life family in Cambodia garnered one of our highest ratings ever, and everyone in the group enjoyed it. "I don't intend to portray the place as miserable or entirely without joy. On the contrary - in spite of its hardships, there are slivers of time when life at the dump feels normal, almost beautiful. Pigs forage in the dirt lanes, children pick teams and play soccer, mothers and fathers banter about their day, babies are born, life presses on." The rent collector at the dump is named Sopeap Sin, though most people just call her The Rent Collector or, behind her back, The Cow. She's an angry and bitter woman, but Sang Ly discovers an unexpected side to her. When she finds a children's picture book in the dump and brings it home for Nisay, Sopeap spots it when she comes for the rent, and her whole countenance changes. Sang Ly can see that Sopeap knows how to read - a rarity in Cambodia - and she tells her she can have the book if she will teach her how to read. Thus begins a series of lessons, first in literacy and then in literature, that change the lives of all involved. "Sang Ly, the desire to believe, to look forward to better days, to want them, to expect them - it seems to be ingrained in our being. Whether we like it or not, hope is written so deeply into our hearts that we just can't help ourselves, no matter how hard we try otherwise." The novel is filled with beautiful passages like that, and I tabbed many pages to transfer to my Quote Journal. Along the way, as they explore literature, Sopeap's story comes out, with plenty of unexpected twists and turns. This novel is a beautiful, moving story about life, hope, and the power of books, and I highly recommend it. See this website for a video trailer of the documentary, River of Victory, plus photos and more information. Sounds good, I've added it to my list at the library. Great! I think you'll like it, Vicki! I remember seeing this book mentioned on one of your wrap-ups and this full review makes me want to read it even more. I am so glad there are photos, etc in the back of the book. Yes, it's a great story, Helen, but even more fascinating when you realize much of it is based on real life! This sounds like a good one Sue. Glad your group enjoyed it. It's rare that we all agree, Diane, but we did on this one!